Hmm, what has happened other than all things computer-related… let’s see. 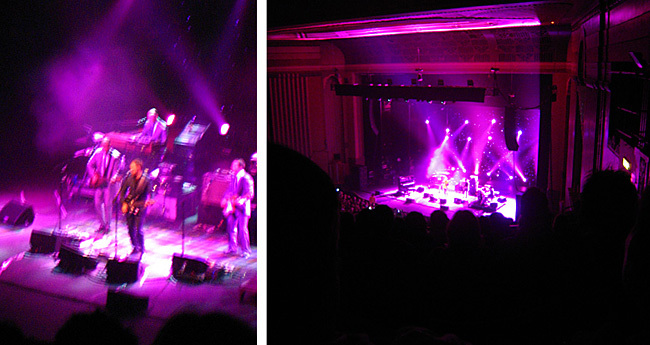 On Thursday Stu, Sooz and I went to see David Gray at Hammersmith Apollo. Sooz got stuck at work so it was all a bit of a close call, but in the end we managed to time our arrival just right, even if we missed the warm up act. All in all, the gig was very nice. David’s voice was lovely and he performed most of my favourites. It was enjoyable indeed, even if he doesn’t have the sort of emotional effect on me like for example Damien Rice has when performing live. However, the most annoying thing about the evening was the audience. I don’t know whether it was because it was the start of a bank holiday weekend, but everyone seemed to be more drunk than usual. Lots of walking around restlessly and clapping incoherently. Oh well. Yesterday Sooz baked a delicious blueberry pie (pictures of which will come later), we went for a walk around town, ate too many chocolate bunnies and embarked on a mission to watch all three extended versions of Lord of the Rings. Mission accomplished.